Travelling by train could soon get uncomfortable for some people with, in some cases, four passengers sitting in the space that is currently occupied by three. This is the result of an earlier decision of the Railway Board, the apex decision making authority of the Indian Railways, to add a side berth in three-tier air-conditioned coaches and ordinary reserved compartments. The current seating pattern in such trains is six seats (three in a row) facing each other (which become six berths at night), and two seats facing each other across the aisle (these become two berths at night). The new berth will come between these two berths. The decision will likely not find favour with passengers, although it could help Indian Railways reduce losses from passenger traffic to some extent. Confirming the decision, R.K. Rao, member (mechanical) of the Railway Board, said that a huge exercise to retrofit existing coaches with additional berths was already under way. In addition, new coaches being rolled out from the Rail Coach Factory at Kapurthala and the Integral Coach Factory at Perambur will have the additional berth as per a new design. “We have in fact started trying out the new coaches with the extra middle berths in a train that runs from Patna," said S.K. Suri, general manager, Rail Coach Factory. 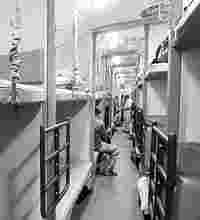 The Railway Board has decided that while the passengers will sleep in the new middle berth, the narrow side seats cannot accommodate three passengers. Thus, this passenger will sit alongside three others in one of the two facing rows across the aisle. Each of these rows currently accommodates three people. One of these will now seat four people. Which of the rows will seat four is something that will be decided randomly through the passenger reservation system. According to some railway officers, who did not wish to be identified, the move to add a passenger per bay could help 10% of the people who carry wait-listed tickets. Some people say passengers, especially those travelling long-distance, will not react well to having an extra seat. According to these people the railways has not sought the opinion of rail travellers before implementing the decision, and may have to face the ire of passengers who are forced to share their seat. “I do not think the railways has taken the right decision. People will start complaining and the train ticket examiner will have a tough time explaining how four people have to share one row while three can share the other," said Arun Saxena, president, International Consumer Rights Protection Council, a consumer rights organization. According to Suri, the benefits of the decision to add a passenger per bay exceed the perceived difficulties that will be faced by passengers. “By adding so many passengers, the railways is doing a service. And I am sure that the inconvenience of sharing a seat with an extra passenger is better than being denied a ticket," he said. The addition of a berth is expected to increase the number of passengers carried per coach by around 12% in three tier air-conditioned coaches as well as the reserved compartments, said Suri. According to a former Railway Board official, who did not wish to be identified, the railways carries around 7.5 million passengers every day on its longer routes and reports a waiting list of around 1 million passengers daily. Last year, the railways reported a loss of around Rs7,000 crore on passenger traffic, which was more than offset by its freight business. “Yet, there is some hesitance to increase fares on the part of the decision makers. So, there has to be some innovative means of finding new revenue streams," the former Railway Board official added.